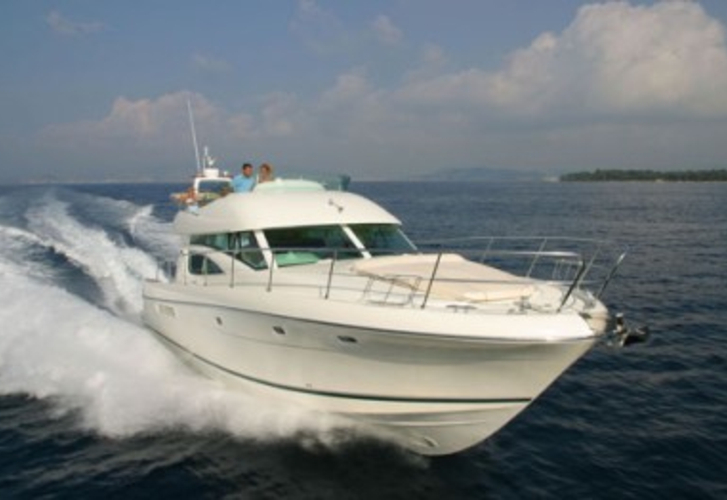 In 2008 was produced yacht Jeanneau Prestige 46 called IRENA III. She is available from harbor Seget Donji in the surrounding area of Split in Croatia. You can accommodate up to 9 pax on the sailboat IRENA III. Arrangment of beds is 9 (6+1+2). There are 4 cabins located below she's deck. IRENA III has 2 toilettes with showers. Search for other boats by opening this link here: Motorboats Split. Tank for fuel is 500.00 l liters big , water container has up to 1500.00 l l. In this yacht there is engine 2 x 430 hp. With 14.55 meters of lenght and 4.36 m of width IRENA III offers enough space for comfortable sailing. Jeanneau Prestige 46 IRENA III is equipped with: Autopilot, Gps plotter, Bimini top, Anchor electric windlass, Radio / cd player. . Caution is 7000.00 EUR. Use our search engine to find different boats in section: Motorboats Seget Donji.